Your child is obsessed with playing video games at home and can’t tear themselves away from the computer. For their birthday, host an epic party at an arcade. Your guests will spend hours playing video games, battling each other in laser tag, testing their skills at bowling and doing other fun activities. We’ve found the best family fun centers that offer parties for kids and teens in New York. Unsure of what type of video game party to have? Check out our three suggestions below. 1. Family fun center: If you have a family fun center in your town or nearby area, then you already know how lucky you are. Family fun centers are a modern take on classic arcades. Play arcade games to win tickets for prizes. Depending on the venue, family fun centers offer exciting attractions, such as laser tag, inflatables, bowling, indoor rides, bumper cars and go karts. 2. Retro arcade: Your kids are probably too young to remember the classic video games of the 70s and 80s, but you sure remember how fun they were. Some arcades offer a mix of modern and vintage games. The kids will be amazed by the stunning graphics of Pong while you struggle to play Guitar Hero. 3. 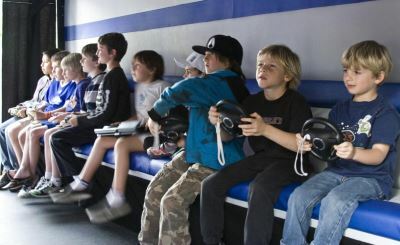 Video game trailer: Bring the arcade to you by renting a mobile video game trailer. Find a service that will provide a bus or trailer filled with TVs, game consoles and seating for multiple people. You will be the envy of the entire neighborhood with your own personal arcade parked in front of your house. Planning a party for your video game-obsessed kid? KidsParties.Party will help you find a venue or service in your area. Simply choose your state and select New York. Need a recommendation? We’d be happy to help! Call 732-298-6015 or contact us. You can find all arcade party venues by clicking here. Create invitations for your party with our free software right here. Just customize any template the way you'd like, download your finished product, and print it onto high-quality photo paper. You can also make one of those templates into a birthday card. Find a video-game related birthday wish here for your little gamer. If you have an arcade place to host children's parties, you can register today to get listed.